Safety Monitoring Platform - Lightspeed Systems, Inc. Web filtering in today’s schools is about more than blocking and allowing web sites; it’s about keeping students safe — from inappropriate content as well as from things like bullying and self-harm — while still allowing the learning and collaboration mobile technology brings. Relay is a smarter filter that keeps students safer. Relay’s patent-pending Smart Agents sit on the device, so users are protected all the time, wherever they go. We have Smart Agents for every OS as well as solutions for BYOD and IoT. And don’t worry: students can’t remove or disable the agents. Relay’s Social Media controls let schools block social media sites, allow social media sites, or allow them as read-only – and these settings can vary by age or group or user so it’s easy to get just the right controls for the right people. Plus, social media activity is continuously scanned and inappropriate content is flagged and alerted on. Online tools make it easy for students to work, create, and collaborate – but it’s critical that schools keep this activity safe. 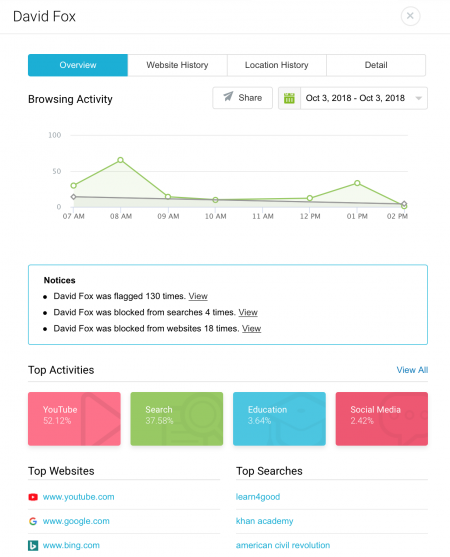 Relay’s advanced AI constantly monitors student activity on sites like Google Docs, O365, and online mail and sends real-time alerts for inappropriate activity. Left unmonitored and unrestricted, student activity online can be dangerous. Relay’s AI keeps an eye on what students search for, what they type and message, what they message to others, and what pages they visit – and provides powerful flagged activity reports as well as real-time alerts. Relay is literally a life saver. Inappropriate content can be just a search away on the Web. But Relay’s SafeSearch and filtered Google Image Search controls keep searching safe. Schools love keeping students safer with Relay!